Chompie’s – Arizona’s New York Deli Since 1979 – is about to get a “ginormous” amount of attention nationwide, and Valley residents and visitors have a chance to get in on all the excitement. The family-owned New York style restaurant, deli, and bakery is being showcased along with two other Valley restaurants on Food Network’s new show, Ginormous Food. The episode premieres Friday, June 2, at 8pm/7pm Central, with several additional air dates to follow. The show launched earlier this year and features – no surprise here – large-scale food at restaurants around the country. 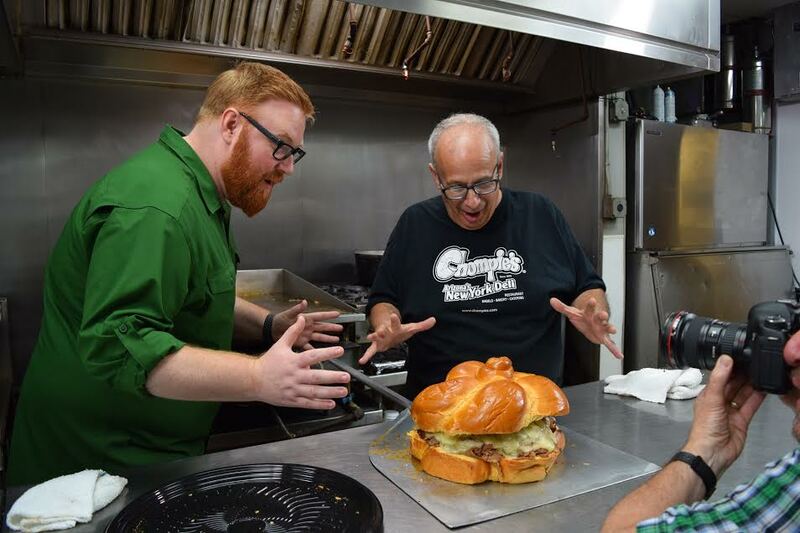 As part of the shoot, Chompie’s cooked up a “ginormous” Jewish slider appropriately titled Bubbie’s Belly Buster. Weighing in at a whopping ten pounds, this beast took 48 hours to complete and included a 36-ounce round challah roll, four pounds of sliced brisket, 12 ounces of brown gravy, twelve slices of Monterrey Jack cheese, and a 24-ounce potato pancake. For those brave enough to take on one “Bubbie’s Belly Busters”, you’re in luck. To celebrate the upcoming Ginormous Food episode, Chompie’s is now offering Bubbie’s Belly Buster for catering at $129.99. The slider easily serves eight to ten people and requires 48-hours’ notice to make. If you’d still like to get in on the excitement but are looking for a more manageable portion, Chompie’s is also offering to “Ginormous size your Jewish Sliders” at all five restaurant locations for a limited time. From June 2 through June 18, you can double the size of the current Chompie’s Jewish Sliders plate. The typical dish includes 3 sliders each at three inches wide. The new special doubles each slider to six inches and will only cost $29.99 (normally $44.97). This isn’t the first time the Arizona restaurant has received national attention. In 2010, Travel Channel’s Man v. Food featured Chompie’s Tempe Location in an “Ultimate Slider Challenge” during the show’s third season. The host failed to finish the massive plate in the 30-minute time allotment.